- New feature: Remove Classifieds. - New feature: Remove Games floating bar. - Removed feature: Remove all blue alerts. - New feature: Remove ad from the top of hi5. - Improved some User Interface. - You can now remove Organized Crime box in profile. - Updated some features due to hi5 changes. - Fixed some features not working. - Updated hi5 profile live preview. - Fixed serious security issues. - Fixed background images not working (without a defined color). - Fixed direct profile preview not working. - Updated new hi5 changes and fixed some codes. - Skin Gallery is released. - Fixed a bug for setting appearance for some sections. - Fixed messed layout when you use a big profile picture. - Updated new hi5 changes. - Gifts and Games sections appearance is now customizable. - New Feature: Remove all Header's text. - New Feature: Remove Footer links. - New Feature: Remove Translation Bar, Instant Messenger and Photo Trip. - Loads of Fixes due to hi5 changes. - New Feature: Set a height for hi5 Gifts. - Fixed the messed Info-Box if you center the content. - hi5 Games stuff added. - Now you can move the Language Badges section. - Fixed the problem of *blank* profiles: Now, if you use IE Effects, your hi5 skin gets blank! Then, I removed it from generator. - Now you can remove "View all my applications »". - Fixed a bug when previewing in your profile. - Very faster while generating the code. - Implemented new hi5 changes. - hi5 Gifts stuff can now be removed. - Fixed the problem of loaded skins from a file weren't loaded. - Improvements to the filters. - It's a bit faster. - Compatibility with the new hi5 milestone (header). - Codes for header were updated. - Compatibility with the new hi5 milestone. - Macedonian language is live! - Fixed a bug when importing old skin configurations. - New features for the new info-box. - Updated the fake profile to the new hi5 patches. - Fixed a bug when previewing directly in profile. - Fixed some other minor bugs. - Fixed 100% a critical bug: "Lots of features = No style generated". - Gallery now works perfect in Internet Explorer 6, Safari, Opera and Google Chrome. - New Feature: Apply effects to images. - New Feature: Profile Body border. - New Feature: Limit the height of About me/Interests. - New Feature: Top Friends names icon. - New Feature: Change comments' first letter style. - New Feature: Remove profile footer. - New options: Remove "Use this skin" and "Give 'em five". - Compatible with the new hi5 milestone. - Faster to load and use. - Welcome tab is now compatible with all browsers. - Fixed a critical bug for IE6: Lots of features get unable to use, when you open Gallery or Upload Photo. - 'Allow pictures to go to gallery' is not default option, now. - 'Import configs from a file' is hidden by default. - Pictures in Gallery counter added to the header. - Generation of font size fixed: the correct unity is "pt" and not "px". - Greek language is live. - New feature: Hide Common Friends. - New feature: Font size to 0pt (really 1pt), if you want try to hide the text. - Own CSS limit up to 5000 characters. - Internal fix to stop spammers. - Critical error fixed: Lots of features = No style generated! - Gallery is live, now! - Preview directly in your profile! - New feature: Custom Cursor. - New feature: Hide all contents and show on mouse over. - New feature: Hide User Details footer. - New feature: Default profile font. - New feature: Run Own CSS before or after the generator options. - New feature: Remove left margin of the replaced photo (when image is big). - New feature: Remove the default backgrounds of mini navigations and profile body. - Online now button now has dynamic width. - Loads of bugs were fixed for Internet Explorer 6. - Upload limit reduced from 1MB to 500KB. - Online people and skins counter implemented. - Configs file is now downloaded on left click. - Some usability and system stability was improved. - Some CSS codes were fixed. - Fixes for dynamic heights. - Spanish language is live. - Some spelling errors were fixed. - Some fixes to the appearance of the generator. - Some fixes to the internal codding. - Portuguese language is live. - New milestone of hi5 profile was implemented. - Some fixes in the profile. - Some fixes in the generation for photo albums. - 'Big header' bug was fixed! - Copy to all sections fixed. - 'Upload images' bug was fixed! - Import configs fixed, also with some spelling mistakes corrected. - Some internal stability fixed. - Initial Beta release to public. - Fixed color picker in Let me Write not working for Internet Explorer users. 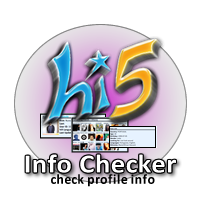 - hi5 Info Checker released. - Appearance in whole site is better. 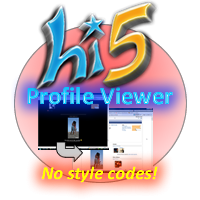 - Fixed private-profile access to hi5 Profile Viewer. - Update to hi5 Top Friends maker. - Fixed some bugs in the tools due to hi5 changes. - Fixed a bug in hi5 Links Generator due to hi5 changes. - hi5 Groups Style Generator removed, no longer works. - Fixed a bug in hi5 Profile Viewer due to hi5 changes. - hi5 Groups Style Generator released. - Address field also appears in links page, in hi5 Links Generator. - New features in hi5 Profile Viewer. - All pages are now XHTML 1.0 valid. - hi5 Profile Viewer is now faster. 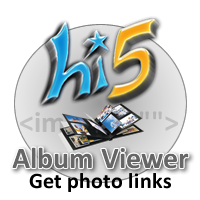 - Stupid error was fixed in links of hi5 Album Viewer. - hi5 Album Viewer released. - Added "view our comments" link to hi5 Links Generator. - Added "view my profile" link to hi5 Links Generator. - Added "favorite, tagged, latest photos", "albums" and "friends" links to hi5 Links Generator. - Self comment to your photo - released. - hi5 filters escaped strings, then I did a fix to bypass these filters, in hi5 Top Friends maker. - Added "Common Friends" link to hi5 Links Generator. - Some messed up things fixed in Internet Explorer 6. - hi5 Top Friends maker released. - Photo links added in hi5 Links Generator. - New graphics in hi5 Let me Write. 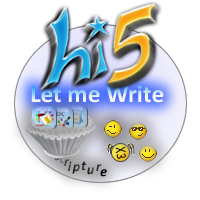 - hi5 Let me Write released. - Style fixed in hi5 Profile Viewer. - "Report Abuse" fixed in hi5 Profile Viewer. - Spelling error fixed in a link of hi5 Links Generator. 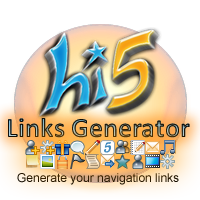 - hi5 Links Generator released. 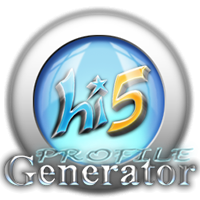 - hi5 Profile Viewer released. 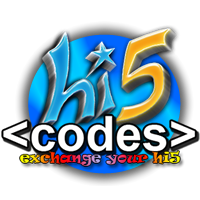 - Community page added to hi5 codes. - hi5 codes application released.